This is a dumb idea....I love it! 900$ Fiero. 5-speed with the 4-banger. I know very little about it and it is 200+ miles away. My friends and I are figuring out how to get it home. 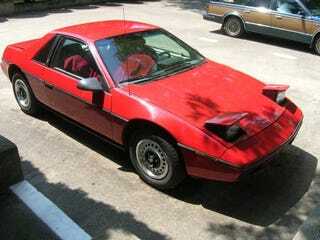 Honestly, 900$ Fiero is all I needed to convince me to give it a go. Thoughts, Oppo? It is blizzarding in Michigan right now and that pic was taken many months ago. Looks like from internet searching he tried to sell in summer but changed heart and just now posted after christmas.